You?ve got a great trading system, but? So you?ve finished reading the book. You?ve started trading. You?ve had some wins, you?ve had some losses. You expected that. Your losses begin to increase and you begin to falter. You consult your favourite psychological trading book for motivation. You review your list of dos and don?ts. You go at it again but continue to lose. Read on for yet another trading tip. I?ll tell you one thing: if you?ve followed the method outlined in this book it?s probably not the system. I started this book talking about psychology. I talked about how important it is to get your head right if you want to be a successful trader. I may have even gone so far as to say if you don?t, you will fail. I will end the book on the same thought. So here’s the last trading tip: to fully master your trading, you must master the most important aspect of trading? yourself. Unfortunately, for some, the battle to rule their own emotions is one they will never win. You may be one of those people. If this is the case, perhaps trading is not for you. Sadly, not everyone can be good at everything. I can pave the way by providing information and support, but without the rock-solid determination to stick to your plan and succeed, you may not get there. And that?s okay. My advice in this situation is to stop digging that hole. Realise that you are not suited to trading, and try something else ? focus on your strengths. Deciding not to trade does not mean that you are a failure but quite the opposite.It?s a very responsible decision to say trading is not for you. Perhaps the nature of successful trading doesn?t sit well with your personality. Nobody is born with killer trading skills. However, with those few exceptions, if you have passion, commitment and the right advice, you can become a great trader.Trading is not a get-rich-quick philosophy. It is a profession that, when mastered, will turn profits. Seeking the proper instruction, with practice, patience and commitment, you will master the skills needed to make a comfortable living. Legendary trader Ed Seykota says, ?Whatever you put your mind to, whatever you expect, be it positive or negative, you tend to draw into your life?. Only you control your destiny as a trader. If you are to be a successful trader, you must have the expectation that you are going to be a successful trader. When you get right down to it, making money trading should be a by-product of adhering to your trading system. It should not be your main objective as a trader; your energy is better spent concentrating on executing your system. A trader?s job is to follow their trading system. If it has been thoroughly back tested and is proven to be profitable, a trader will get paid.It really is as simple as that. Reaching this point means that it?s time to hand over the reins and let you gallop off into the sunset that is your financial future. Congratulations on making it all the way through! Most people pick up books like this one, looking for a quick, simple solution to a short-term financial crisis. You?re obviously not like that and that means that your chances of success in the markets have skyrocketed. But, as I?ve said all along, it won?t happen without commitment. This means a commitment to maintaining the right mindset, a commitment to your trading plan and a commitment to ongoing learning. It?s customary to wish people luck at the end of a book like this. I won?t do that. Luck really has no place in trading. I do however wish you the strength to forge on and to stick to your trading system. I hope you have found my trading tips useful. Remember: there is a lot of help out there ? read some of the books I?ve suggested, check out my website, talk to other traders. You can never learn too much. And if you think education is expensive, try ignorance. Drop me an email to let me know how you?re going www.davidjenyns.com/support – I?d love to hear from you! I?d also like to take this opportunity to invite you to join my coaching program. This book really is only an introduction to successful trading. If you?re serious about becoming a confident, consistent, disciplined trader you should consider joining my coaching program to move your trading to the next level. I just finished reading your Ultimate Trading Systems 2.0. The reason I finished reading so quickly is that I could not put it down. As a beginner, I now have all the info I need on how to get started in Fx trading. I have down loaded tons of info on the subject but this manual is all you need all in one book. As a beginner, I do not think you can start to Fx trade without first reading this manual to fully understand what is involved. I just finished reading Ultimate Trading Systems 2.0. I found it a very good tutorial on what a new trader should be doing before starting to trade. It stresses that a person must make plans on how he is going to develop his trading plan prior to trading. The book not only stresses the absolute need for a trading plan, but it shows how to make one. It is an important read. Just wanted to comment on the book as requested. I find the material to be very usefull for new traders provided they take it to heart. I am a full time trader and have basically learned the lessons in the book after years of trial and error and thousands of $ in courses. I believe that everybody needs to find their own sweet spot when it comes to trading system and which market they trade. for me it turned out to be the forex market and gladly, I see that the book helps new traders find their place in the trading landscape. The book is comprehensive and direct to the point with references to other authors. It is obvious that David has done a lot of research and has personal experience which he is passing on to other investors. The part of back testing might be difficult to grasp, but in reality is true, one is always looking for a system with more winning trades, but as pointed out might not be the most profitable system. I believe the UTS 2.0 will definitely be of great assistance to traders, especially someone new to the markets will realise it takes a lot of discipline and hard work to achieve success. You have compiled a down to earth explanation of vital information. The trading experience can be either supremely rewarding, or utterly debilitating. Strict adherence to the principles discussed in your book will lay a firm foundation for ensuring a trader enjoys the rewards. You have bring me to another angle to view what is trading. Especially 20:80 rules, and how important on back-testing. These are the pieces I miss in my puzzle. Thanks for your reminder and I believe I will do better afterward for my trading. Keep your good job, David! Hi David, In these days of mega-information overload, it is refreshing and quite delightful to read a compact, concise and very readable “big picture” overview of how to trade the markets and make money. It is relatively easy for anyone ( self included) to know a lot about a small part of the story; without having the overview that your book offers. So, well done and all power to you. Remember to pay it forward and share this website with your friends, family and colleagues… I’ll be eternally grateful. I have gone through all your chapters it is fantastic. Thanks a lot for advise you have given. Keep up the good work .I need more things about money management.I have gone thought many signals to enter and exit a trade.Like RSI,MACD etc i think nothing work in the real market ðŸ™� . What is your approch. I wish I had found this website 2 years ago. It would have saved me thousands of pounds in training fees. I have spent ?7000 in training all of which are summarised on this site. I have also run across charltons who claim to have a profitable trading system insisting on money upfront then found out their system is 45% accurate with an average win of 19pips and an average loss of 29pips. Kudos to you on providing some valuable free information that makes the public finally find someone they “respect” on the internet. Absolutely, I have gone through every one of your lessons, made notes and now will work through “step by step” the course of action you suggest. Hopefully I won’t get stuck too long on the analysis of my system when I finally get it up and running (LOL). I feel I’ve been searching and searching and searching for something that makes honest the goodness sense, and isn’t trying to trap me into an upsell, upsell, upsell. One of the sites I came across the other day appeared genuine and awesome, till I clicked on affiliate link and read what it said the unsuspecting public like me would be spending and with all the likely upsells they’d be making on me. Left there very quickly. Also too many of these type of sites, give you a bunch of garbage and then tease you to leave your contact info = ‘x’, and we’re wise to the cancel leaving the page as well. Sorry, I digress I just wanted to say you have been AWESOME and like a breath of fresh air to find. Without a shadow of a doubt, if I unfalteringly apply what you teach here and it works, I will for sure be coming back to you with a donation and maybe coaching. THANK YOU ON BEHALF OF MANY OF US OUT HERE THAT KEEP SEARCHING FOR THE SHOW ME DON’T TELL ME in this world of trading. David, Enjoyed the videos and material very much. Very helpful. Is your book a repeat of this material or do you go more in depth in the various aspects you cover on this website. Since you offer many different trading modules (books) do you have a recommendation as to moving from one to the other in sequence. Thanks for the kind words. 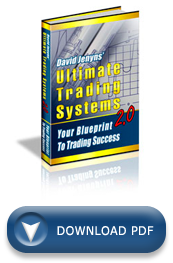 As for the book (www.ultimate-trading-systems.com), yes it’s simply what you have read online at http://www.freetradingsystems.org in downloadable format. You can read it for free online on this website or download/print it out for $7. As for your next step, I would say joining the http://www.onlinetradingmastermind.com is the best way to go. If it’s closed at the time of reading this please contact: http://www.davidjenyns.com/support and we’ll work something out. Been trding for two years now, when it came to trading my own money i really started to learn. Your absolutely right in what your saying, and im ashamed to say even though i read this in nearly every trading book and site i read, i truly found this out and realised how important it all is to have a system by experience and hard work and losses. I only got to this stage by sticking with it and a solid belief in my abilities. For those starters that read this, this is the only way to make living from the markets………. All the best and happy systems away!!!!!!!! Thanks for the kind words and contributing… sounds like you’re on the right track now. Stick with it, the rewards are worth it! Trading is a new interest of mine that I picked up about a week ago. For years now, I’ve invested time and energy researching ways to make capital growth in a field that I enjoy. Trading was NEVER and idea that crossed my mind until a friend of mine passionately explained to me what he does in addition to his 9-5 job, steady income job. I’ve always been intimidated by the idea, until he had shown me what he does 20 – 30 minutes in his portfolio a day. Granted he has been doing it for well over 10 years and his 20 – 30 minutes of devotion has been become somewhat intuitive, it still an amazing talent I know I have the mind set to obtain and succeed at. Your website https://www.freetradingsystems.org has been an amazing instrument to help me develop skills and gain knowledge in a path I’ve never ventured before. Its so well broken down and I can really tell you have a passion for doing this. I just want to say.. Thank you for putting it together. Just last night I downloaded the “Ultimate Trading 2.0” to jump start my “plan”. One thing I started 3 days ago was a virtual trading game using real data and a virtual budget of $10,000 on http://www.marketwatch.com. This takes the “emotional” connection away so I can really learn from my mistakes, make smarter decisions and develop my plan.